How much would you donate to a Kickstarter funding the release of new Syd Floyd concert footage? Last edited by Haight Trashbury on Sat Apr 13, 2019 1:32 am, edited 4 times in total. I assume any funders of over, say, USD 50 or 100 (you decide) would receive a DVD/Blu-ray as part of the deal. Count me out, seeing how I was never a great fan of the Syd Floyd era. There are some that might be interested so gook luck with your project. I JUST tracked down the owner of the storage facility that supposedly has the Syd tapes. I’m gonna be calling him on the phone in a few days. Will update you on how it goes. Last edited by twcc on Thu Feb 14, 2019 7:16 pm, edited 1 time in total. hope you find the footage! it would definitely get funded. I know it’s been a while, but I’ve got a lot of new stuff to share with you guys, practically all of which is big news. 1.) I just got an email from Sheldon Rochlin’s family (the owners of all of the material from Schon and Rochlin’s films, including DOPE) stating that they would help me recover their footage. 2.) The owner of the Long Island film vault that I mentioned in my initial post passed away a few years ago, and although this certainly did not result in the destruction of Schon and Rochlin’s footage (it would be completely unreasonable to assume that a professional establishment would be that careless with someone else’s property), it very likely resulted in their relocation. 3.) I just developed a major connection to Jo Durden-Smith’s family, and am working to locate outtakes from “It’s So Far Out, It’s Straight Down.” If recoverable (and still extant), this material will be packaged alongside the DOPE footage in my Kickstarter. 5.) The entirety of the 14 Hour Technicolor Dream was set to be recorded by an Italian film crew. No idea whether this happened, but color footage of the event (complete with audio from Soft Machine’s performance there) appeared in Tinto Brass’s 1967 film Col Cuore in Gola, so at least some of it was taped. I sent an email out to Brass asking where he got this material, and I’ll notify you if I get a response. 6.) Bernie Andrews, a (now-deceased) British radio producer, made high-definition copies of all of the Floyd’s BBC sessions before the network wiped them. This should include a proper studio version of “Reaction in G,” as well as the complete, voiceover-free recordings of Syd’s soundtrack work for “Tomorrow’s World” (the “Green Onions” cover and the untitled, 1:42-second instrumental jam). His family should still have the tape. 7.) After his death, the entirety of Jack Henry Moore’s video archive was acquired by a company called Dig Media. The collection should include two complete concert tapes of Syd Floyd at UFO with the original sound (one fifty-minute show and another twenty-minute one), and it is currently slated for public release. I will time the onset of my crowdfunding campaign such that these two events (hopefully) do not overlap with each other. Last edited by Haight Trashbury on Wed Apr 03, 2019 8:26 pm, edited 3 times in total. It would be fantastic to see some new video from Syd's era of Pink Floyd. Definitely keeping an eye on this thread. I don’t know why I didn’t get around to mentioning this until now, but the date for this concert is March 3, 1967. They were there supporting Soft Machine, who headlined. I don't read the poster as Pink Floyd were supporting Soft Machine on any of the dates listed ... 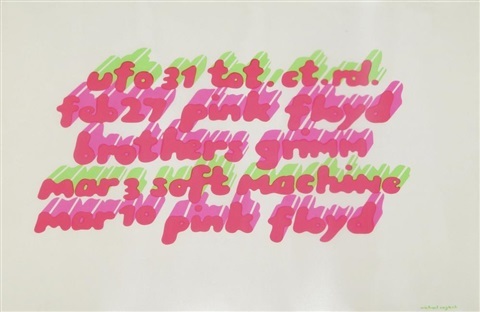 I read it as (a) 27 February Pink Floyd were supported by Brothers Grimm, (b) 03 March it was Soft Machine and (c) 10 March it was Pink Floyd. PS, I have not cross-checked with the Vernon Fitch books. Yeah, I noticed that too. It appears that the poster doesn’t list the supporting acts. I cross-checked the date in Echoes: The Complete History of Pink Floyd, and it said their that both Syd and Soft Machine played on March third. It is likely that both of these acts were filmed. Glad that my site could help you (many updates are coming soon by the way). I had a (reliable) contact who told me about the existence of these tapes several years ago. I just got another email from Sheldon Rochlin’s family. Apparently, they lost track of all their footage after Sheldon died. However, they’re maintaining an open correspondence with me to see what I find. I’ve had a bunch of info about the (deceased) Long Island guy for a while, though, so I don’t think it’ll be too hard to track down his widow and get some new information. I’ll tell ya all how that goes.